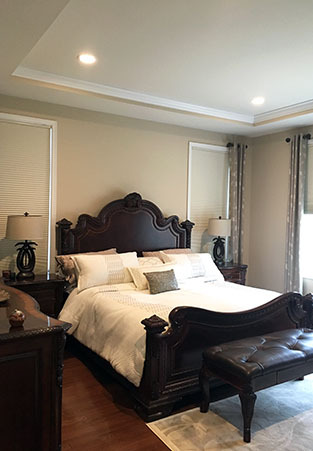 When you hire Arch Painting, you can be confident you’re working with a residential interior painting contractor that cares about only one thing: your total satisfaction. As New England’s house painting leader for nearly 20 years, we’re committed to providing you with both a beautiful finished product and an unparalleled customer experience. We treat your home and belongings with respect, do a quality job, and always stand behind our work. Convenient, reliable service: Our interior painting services can be scheduled according to your needs—including weekends. You can count on our crew to show up on time, work hard, and clean up after a day’s work as if they were never there. Click here to learn about our exclusive, convenient color consultation offer. Fair and accurate estimates: When our estimators give you a price for a job, rest assured that’s the price you’ll pay. Need something changed along the way? We’re always glad to adjust and re-quote. Impeccable craftsmanship: Our process guarantees a paint finish that not only looks great now; it keeps your home looking elegant and well-kept for years to come. No payment until the job is done: While other interior house painting companies require a deposit before a project even begins, we won’t ask for a dime until the work is completed—for all jobs under $10,000. Protect: Before starting any project, Arch Painting takes all necessary measures to protect your belongings. All furniture, floors, fixtures, hinges and doorknobs are covered and masked to shield them from dust and paint. Prepare: To lay a flawless foundation, our crew thoroughly prepares your walls prior to paint application. This means filling nail holes, stripping old wall coverings, repairing plaster cracks and holes, and caulking gaps where trim molding meets walls and ceilings. We also carefully sand and dust all surfaces. Apply: Taking into consideration the unique requirements of your project, our professionals use the latest interior house painting technology and equipment to produce a finished result that adds refinement to every room in your home. For more information or to find the option that best fits your needs, click here or ask your Project Manager.